A rare-find in Zachary!!! A large home on acreage within the city limits! Property is enclosed on three sides by 8' chain-link fence with several pecan trees. Entering the driveway, you notice the newly painted exterior, the metal roof, the wrap-porch at the front and the tall flag pole. When you enter the back you see the large concrete parking lot 141.8' x 82', the stucco fountain enclosure, the large concrete patio 65' x 80.5' and the guest house/office. As you enter, there is the large den 14.4'x47.4', complete with wood-burning fireplace, ceramic tile floors, ceiling fans, bookcases and twelve 4'x4' windows of solar glass! Off the den on the left is the 4th bedroom and its bath. Middle French doors open to the formal dining room ceiling 25' height and wood floors with its fireplace flanked by windows, and balcony view from above. French doors on the right open to half bath, laundry and into galley kitchen and breakfast/keeping room with its great windows! The kitchen is complete with smooth-surface electric stovetop, stainless steel double wall ovens, dishwasher and full s/s refrigerator/freezer twins. The custom cabinets are pecan wood, with a large island with drawer microwave, a two glass-door china cabinet, drawers and all topped with three centimeter granite. Special lights and two pantries complete the area. Off the foyer is the study/gun room/office with wood floors and special iron-bar door. 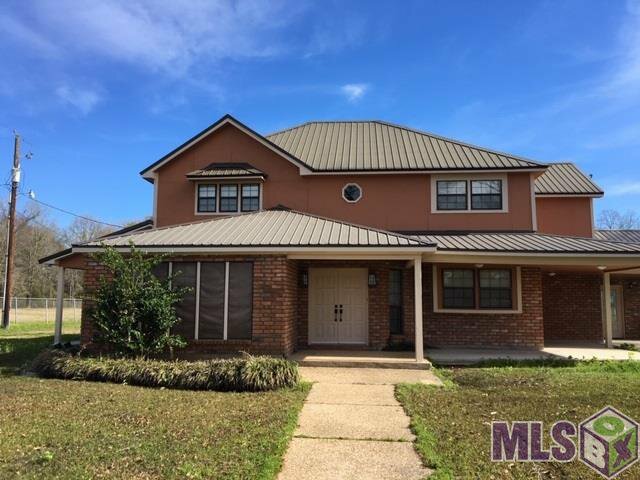 Upstairs master bedroom with walk-in closets, granite top double sink vanity, separate water closet/bath rooms while on opposite side of the house is two bedrooms and full bath.The upstairs balcony looks over the formal dining room, 25'. Included are three shops at the rear, one is 40'x70' sheet metal and concrete floors with two roll-up doors, office, restroom and wall shelf storage. The 2nd 30'x100', is three-sided enclosed sheet metal pole barn with five bays. And a cinder block building 20'x50' (damaged). Rear fenced dog yard and garden area have water service.